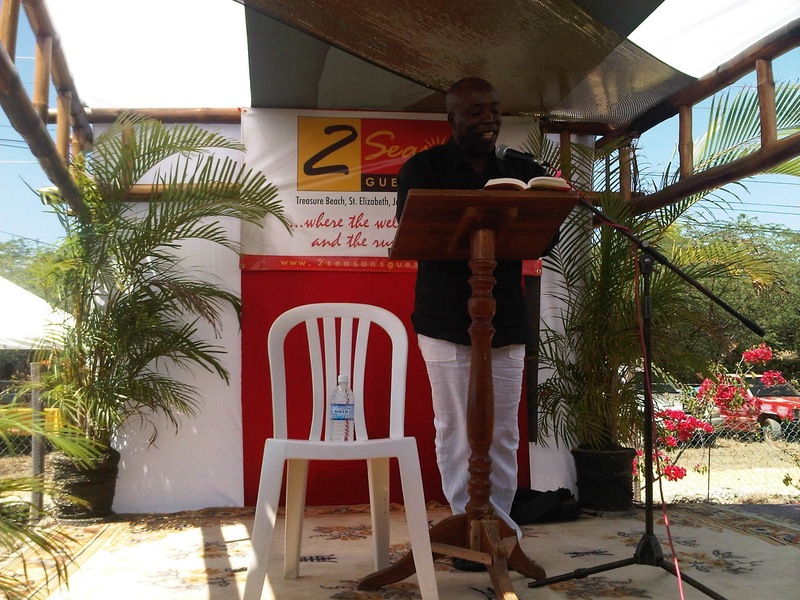 On what was possibly the biggest line up of Jamaican artistes reading from their own work, readers at the Two Seasons Guest House on May 28 had the audience laughing as they reflected the on the pathos and joys of our society. 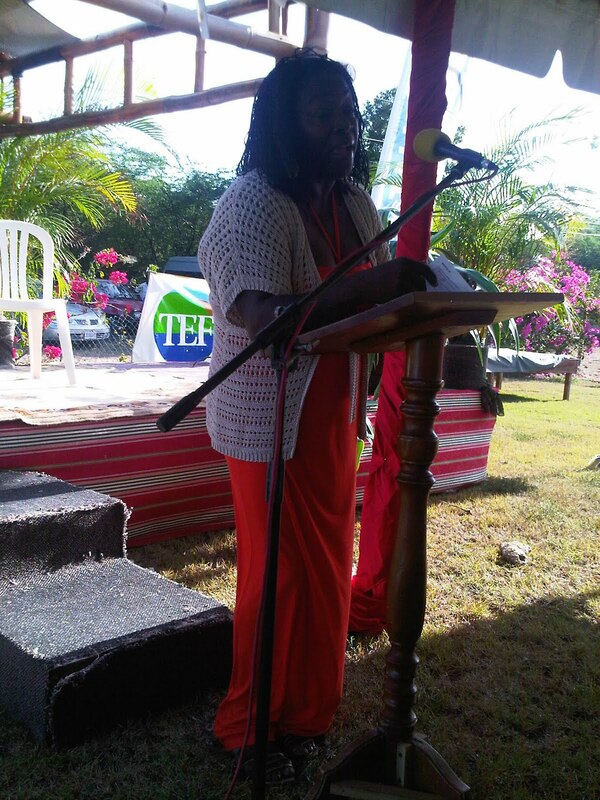 The event featuring fourteen Jamaican writers, and publisher Ian Randle, drew about 300 persons for day two of the Tourism Enhancement Fund-sponsored Treasure Beach Breadbasket Festival that ran from May 27-29. Book seller Bookophilia allowed for connections with the writers and also had a range of local and Caribbean publications on-hand. Master of Ceremonies for the day was Gwyneth Harold. Novelist Garfield Ellis opened the show with excerpts from Till I’m Laid To Rest. The excerpt included a conversation between two women on making life in the USA. An authentic voice from the Diaspora, Pamela K Marshall is a social worker whose experiences were the muse for her first novel, Barrel Child. Talking Trees was the Jamaican launch of her book. Sarah, at age 18, had not seen her mother in 14 years until she migrated and is living with her step family in the USA. “Can material things truly compensate for a mother’s love?” is the haunting question the book addresses. 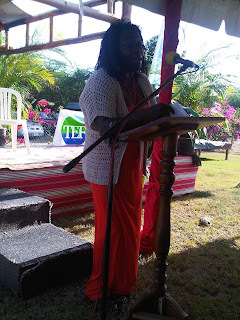 Short story writer, Nova Gordon Bell, received the only standing ovation for her evocative readings and the satirical piece that she used to finish her set. “These people, Lord these people. You cannot help them no matter how hard you try… No matter wha di politician dem try to switch. No matter how much song dese people sing, no matter how much gold medal dem waan to win. This country must know seh class is class! Theatre professional Jean Small read from her work-in-progress about co-founder of the Little Theatre movement, and one of the earliest stars from Calabar High School, the late Noel Douglas Vaz, who Edna Manley called, The Theatrical Magician. Connecting perfectly with the audience, Veronica Carnegie had the crowd in stitches as she delivered her stories including re-wording the inappropriate nursery rhyme Three Blind Mice and also words to Hilda’s song and the children whose mother did a wrong thing and went to jail in a foreign country. For how could we not know better? 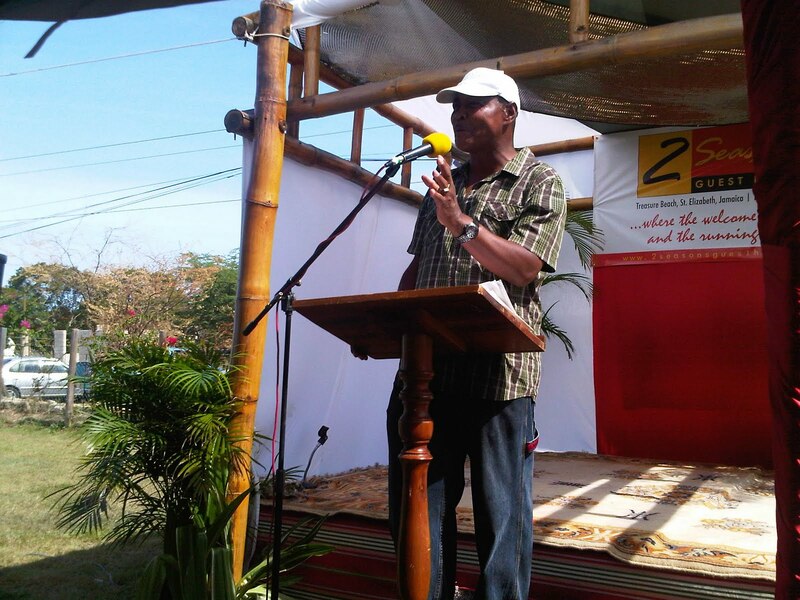 Tomlin Ellis paid tribute to other poets with a piece that he said emerged from a 1989 Poets in Unity workshop. Dem poets write the poems to open you eyes. So write and chant poetry with the J’can descant. Dub poetry still relevant in dis yah era. Biting angst rippled at sunset in 1942 at the Myrtle Bank lounge between Aisha Davis and Keiran King’s characters in a scene from Keiran King’s production, Last Call. The musical runs through August at the Philip Sherlock Centre for the Creative Arts, UWI. 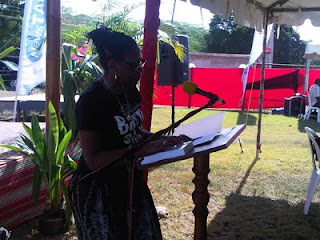 Headline performer, Joan Andrea Hutchinson, dug deep into her vast repertoire and delivered a riveting 90-minute performance that included proverbs, reflections of love and relationships; tales of old Jamaica and goings on in contemporary society. “Baby me check for you and you done well and know; but a man can’t mek him feelings show….man a thug and thug no suppose to show love. 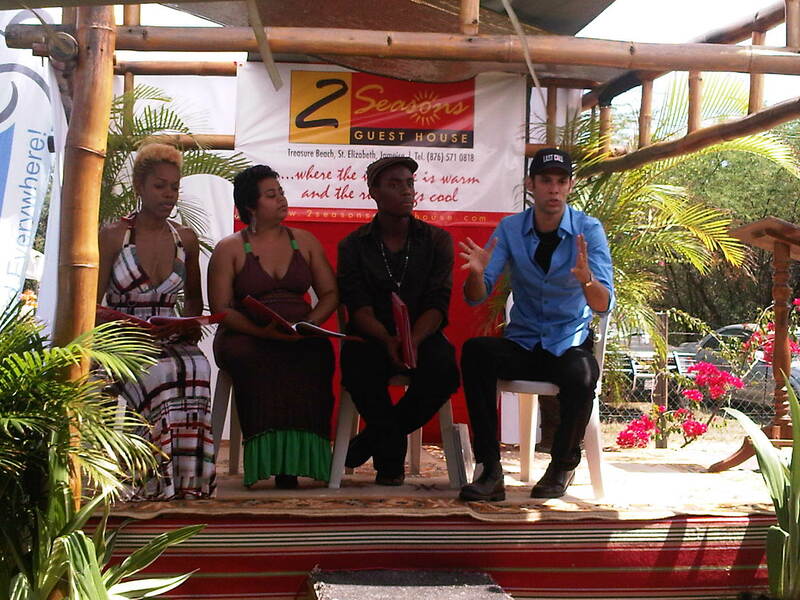 Issues around publishing were discussed in a one-hour segment with moderator, musician Joy Simons Brown and featuring e-zine publisher and writer, Tyrone S Reid; Ian Randle of Ian Randle Publishing; and Judith Falloon-Reid of the Independent VoYces Literary Fair. All agreed that it cost just as much to put out a good piece of work as a bad one, so it was better to make the investment worthwhile. 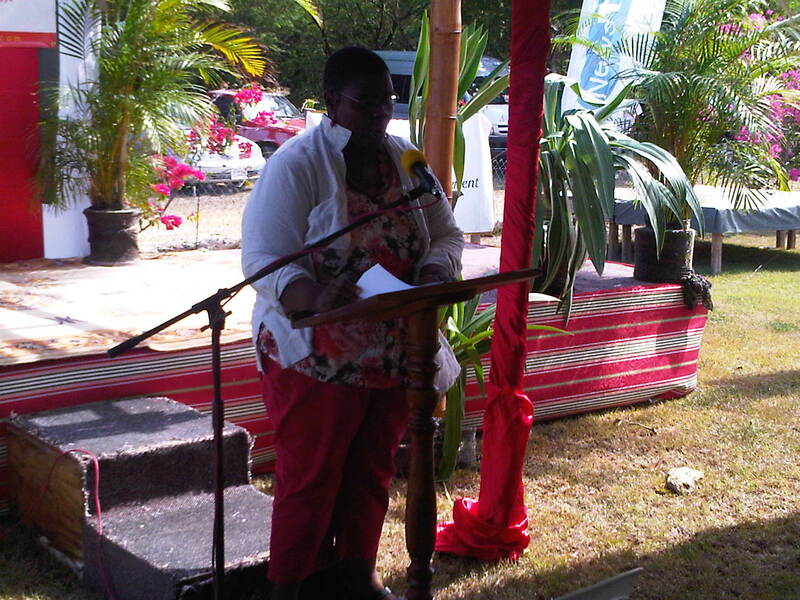 Falloon-Reid was passionate about writers not waiting on a publisher to be published; while Randle said that publishers provided a service as all other services. Despite the advance of digital book readers, the panellists and audience seemed to agree that books will still not become redundant.